As a disclaimer, let it be known that I put Mozart on the pedestal of all pedestals, and that my opinions on the man himself are likely to be biased. Besides his evidently acclaimed works, I find that nothing visually depicts his talent better than Miloš Forman’s Amadeus. My first glorious encounter with Amadeus, literally meaning “God’s Beloved”, was over a decade ago. A personal, deep-rooted love for music from an early age has persistently flourished into what I think will be an indefinite experience. If you have seen Amadeus, you may say this feeling carries a similar tune to that of Antonio Salieri’s (F. Murray Abraham) childhood dreams. He, too, loved his music, but he (unlike me) prayed to the high heavens that he receive the gift of writing God’s music for the world – a heartwarming, innocent desire of a child, devoid of malice. It is at this precise moment in the film that we sympathise with his character, and relate in a way that a regular biopic might not allow, through a fictionalised account. To be able to pay homage to Mozart’s timeless repertoire was the closest I’d get to my classical music dreams coming true. And yet, in my single-digit days, there was the slightest twinge of jealousy that a boy, four years after his birth, was composing pieces of massive complexity (to say the least) to the high standards of a fully grown composer. Did we not all, perhaps, long to become as great as one of the greats? To describe ‘Wolfie’ (Tom Hulce), as his wife enchantingly calls him throughout the film, as a ‘genius’ is arguably the only way one sees fit. But enter reality as an aspiring musician, wanting to leave a mark just like Mozart, and you find we can’t all be brilliant virtuosi. This sinking feeling, one of despair and frustration, is quite aptly depicted through Salieri’s character. Salieri was an accomplished Italian composer in his own right, garnering much success as Court Composer in Vienna. The incredibly dramatic start to the film, with Salieri’s attempt at taking his own life (see the bandage around his neck), quickly hurtles us into a descriptive narrative, recounting his story with Mozart to a young, horrified priest who keeps silent for most of the film. Prior to the delivery of the immaculate facial expression in this #stillshot, Salieri has just received original manuscripts of Mozart’s current works, secretly delivered to him by Mozart’s wife, in a desperate plea to find Mozart a teaching position at the royal court (Mozart, unaware of this event transpiring, is adamant that he will not show his manuscripts for approval, because his music speaks for itself). Salieri flicks through the manuscripts, baffled by the fact that these are originals – without a flaw or correction, as though Mozart has written the whole thing in his head before transcribing on paper. Through a succession of flashbacks to the past, our narrator Salieri grows in envy – he was, as he said, ‘filled with such longing’, and quite bitterly acknowledges the fact that God purposely chose his music to be delivered to the world through the receptacle of a ‘vile, little creature’. Salieri, until that point, had lived his life essentially a purist – he never touched women, never stooped to the lowly thoughts of foul men, and represented all godly ideals. Through the pained expression on his face, aided by deep-set wrinkles highlighting a life of apparent anguish and disdain, he is made fully aware that he is hearing the ‘very voice of God’, and achingly describes himself ‘staring through the cage… at an absolute beauty’. There is no clearer body language to depict this than through the theatrical placement of his hands, which quite genuinely emphasise the inexorable admiration he has for the divine music he simply cannot, but wishes to, fault. Putting aside the top-notch dialogue, sublime background music, and Abraham’s supreme acting, I particularly love the use of the word ‘cage’. What better way to describe a feeling of watching your desires snatched away from you than through the rivalry of contemporaries? What we feel through Salieri’s delivery is indeed a very real human emotion, one that perhaps strikes a chord in some more than others. The course of the film revolves around a more sinister approach to ‘getting back at God’, taking away ‘his beloved’ from the world, which is satisfying for the plot. It is gripping to watch from afar a man’s strong inferiority complex and his suffering under the plaguing influence of mediocrity, while the majority of us opt to take the more ordinary route of living with this every day. In light of dealing with our seemingly evident ‘shortcomings’, is it really possible to despise everything that puts us in that position of being ‘non-extraordinary’, or can we graciously move on to higher grounds by acknowledging that these are no shortcomings, but possibly just embodiments of humanity? 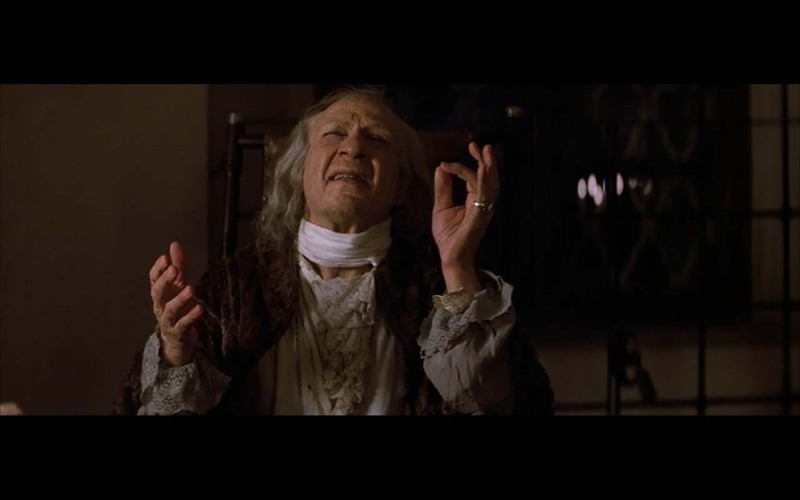 In Amadeus, and this scene, we are reminded of the very essence of being human; to simultaneously appreciate, admire (I encourage you to just hear the way in which Salieri describes Mozart’s music!) and despise that which we aspire to be. Just as there are geniuses, there are the mediocre, and the mediocre are usually in the majority. In a film that is primarily about a supremely talented man, it was perhaps inevitable to target those among us that cannot be Mozart, and those that are left possibly staring through the prison cell of Salieri’s mind through their personal stories. Fanciful dreams of being a prodigy (for any of you who have felt this) will pass, and accepting the mundane will always be the easier option. Sam is a student of Chemistry at the University of St Andrews, but aside from making mean drugs, the loves of her life are music and film. When she isn’t lusting over techno and cinematography, you can find her improving her knife skills in the kitchen or hanging out with her buds. I read this article and found it very interesting, thought it might be something for you. The article is called Amadeus: On Maestros and Mediocrity – #stillshot and is located at http://prancingthroughlife.com/2016/03/24/amadeus-on-maestros-and-mediocrity-stillshot/.